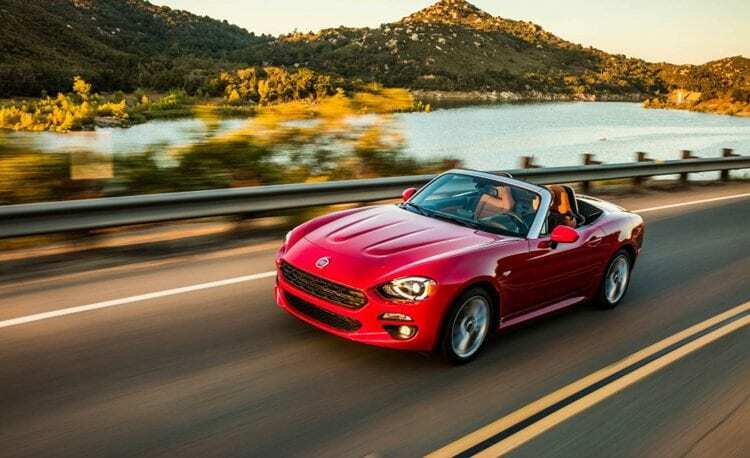 The first ever Fiat 124 Spider was manufactured back in the mid-1960s and since then has become a superstar in coupe segment, generating large volumes of sales for the company for nearly twenty years. Apparently, it was time to revive the legend once more and surprise the fans with an even more remarkable payload of features and impressive design. To manufacture 2017 124 Spider, Fiat has tied-up with Mazda, which was developing its brand new 2016 MX-5 Miata, and the two models received a lot of identical parts and elements. The plans to make a new Spider came at the Geneva Auto Show in 2015, when FCA representatives announced that the year would be the year of Spider. Indeed, this model was finally demonstrated at the Los Angeles Auto Show and caused different reactions from the reviewers and fans. Some of them claimed that Spider had too many elements borrowed from theMX-5 Miata, and the others said that Fiat was able to design a unique vehicle with the styling of its own. Well, let’s see this on closer and make up our minds. 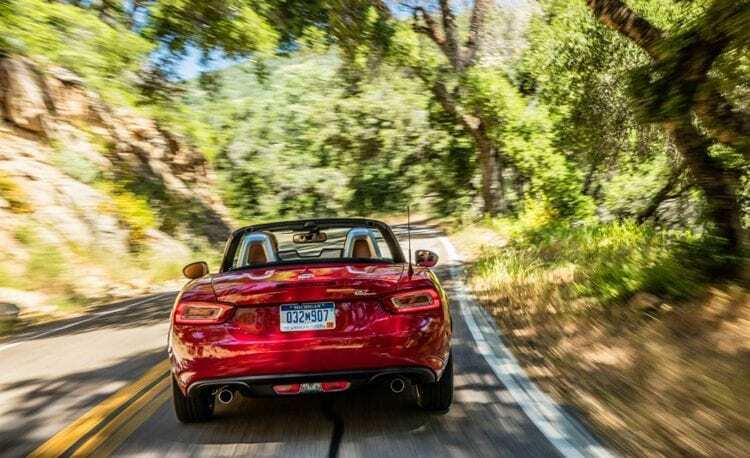 According to the Fiat’s officials, the 124 Spider indeed has many elements of MX-5 Miata, including the platform, which makes all underpinnings of the two cars to be similar. However, the Italian manufacturer did a good job of masking this by giving Spider its own unique exterior styling, which does not have a single similar element with its Asian sibling. If one does not know that the platform is shared between these two vehicles, this secret will be most likely to remain undiscovered. Moreover, the cars have been equipped with two different engines and lots of other stuff that will make you vote on ‘different.’ To be completely honest, this is not a first time that we see car makers share technology and solutions, this was done by other manufacturers, and we have no complaints if the result is a great product. 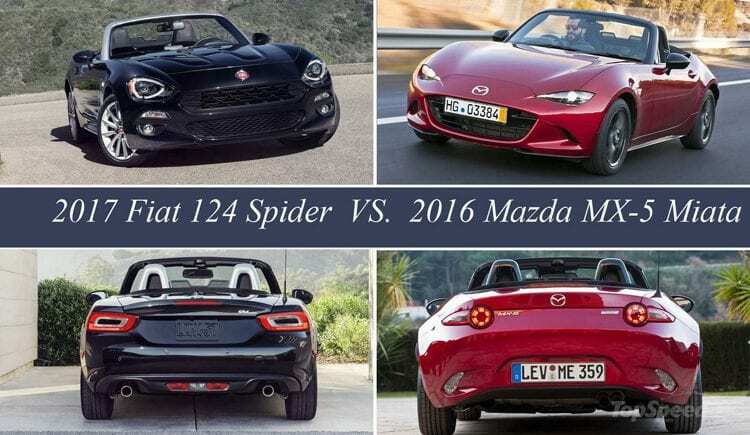 If Miata and 124 Spider are compared regarding exterior styling, the differences are apparent: the Japanese sibling has all those smooth curves and traditional Mazda’s attention to details plus functionality while the Italian sibling is… well… classically Italian product. Fiat has decided to revise everything even if it meant increases in development costs (this is true). The hexagonal grille, turn signals below the head clamps, trunk, upper edges, rendered body sides, and other elements reminded us about the original Spider models of the 1960s and 1970s. Of course, the designers have included some new elements, such as fog lamps and lowered grille, but they are perfectly aligned with the classical roadster elements. Without any doubt, Fiat did a fantastic job in combining the old and new cues in the latest 124 Spider, so bravo here. The only thing that has to be said at this point is that Spider is indeed larger than the Japanese sibling. Specifically, it is 5.5 inches longer, and 0.2 inches wider, and the Italians also made it a little bit lower (just a tenth of an inch), which is barely noticeable. Many reviewers suggested that 124 Spider mostly resembles the interior styling of Miata, which is true to some extent. The Italian offers higher quality materials and features entirely different seats, stitching patterns and bolstering. 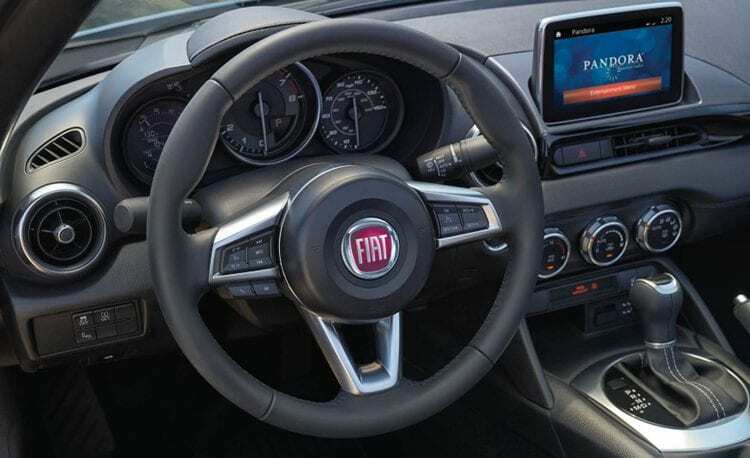 Even though the vehicles share an almost identical dashboard, Miata does not have the soft-touch material cover on the top and upper parts of door panels. The passengers and the driver will be entertained by the Mazda’s own infotainment system, which features Fiat’s crisp and vivid screen (previously used infotainment system from Chrysler did not work on the hardware provided by Mazda). Given that the model has a convertible top, the designers have provided great sound deadening materials to make the cabin quiet, including acoustic insulation. If the ride is to be added with music, the premium Bose sound system will be at service allowing this vehicle even to satisfy those with higher requirements in this segment. 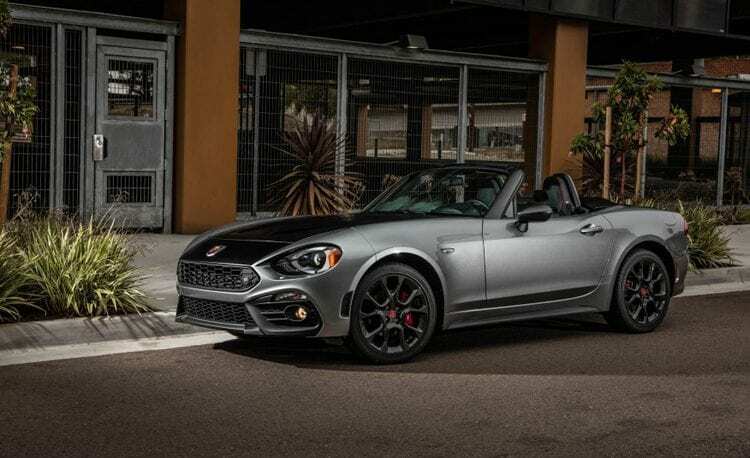 Regarding drivetrain, 124 Spider has received many Italian-made elements: it has been equipped with the 1.4-liter four-cylinder engine that was also featured on some previous models, including Fiat 500 Abarth. However, given that Spider’s body was designed to be a little bit lower, the engine was slightly modified to lie comfortable under the hood. According to the manufacturer, this engine is combined with a six-speed manual used in an earlier MX-5 model. Together, these elements can generate up to 160 horsepower and 184 lb-ft of torque, which allows reaching 60 miles per hour in just 6.5 seconds. The model’s top speed is 130 mph that is more than enough for a comfortable ride in an old school roadster and a decent amount of speed even if you want to take it for a spin on the track. 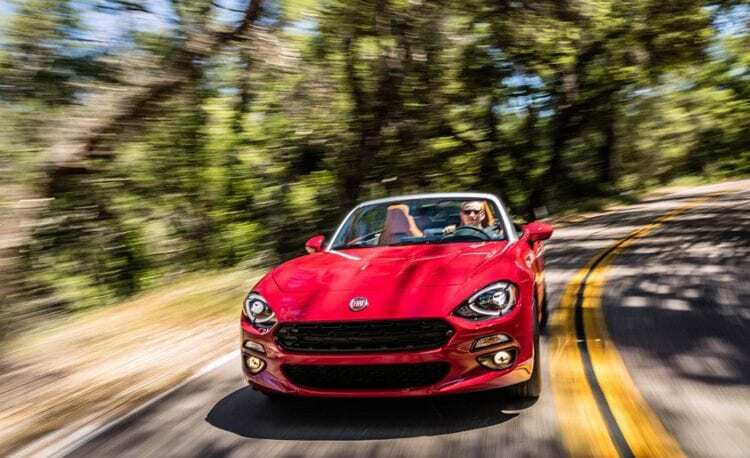 Fiat will be selling 2017 Fiat 124 Spider just in two trims, Classica, and Lusso. Obviously, Classica means Classic, and the Lusso represents Luxury in English. The first respective level will be equipped with the following list of features: 16-inch wheels, dual exhaust tips, cruise control, 7-inch touch screen display, power windows, power locks, halogen headlights, premium upholstery, Bose sound system with six speakers, and air conditioning system. The Lusso level adds some high-tech functions, such as automatic headlights, automatic cruise control, 17-inch wheels, and premium leather seats. 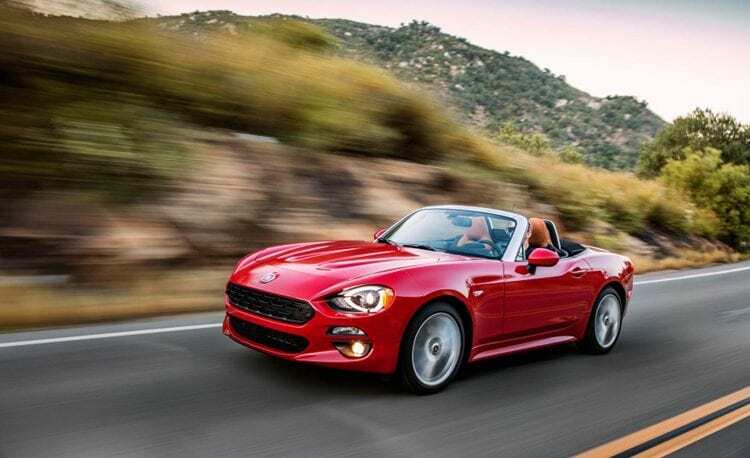 According to the manufacturer, the customers of 124 Spider will have several options for packages, including zooty Premium, Comfort, Tech, and Safety Collection that allow every driver to make its ride pretty unique. 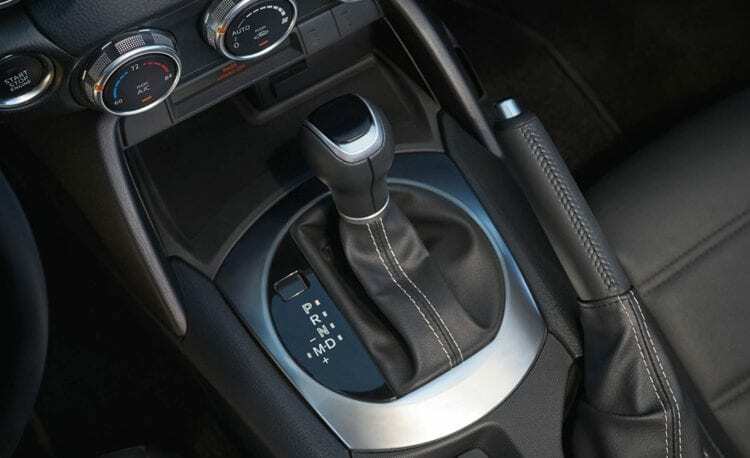 Base transmission is manual while the automatic comes as an option that is $1,350 extra. As for the safety, the designers should be rewarded with an A because the model is pretty much packed with all high-tech and latest features. Their list includes a rear backup camera, Rear Cross Path Detection, Blind spot monitoring, pedestrian detection, three-point seat belts and a variety of airbags. Moreover, it should be added that the body was manufactured from high-strength materials which optimize the protection of occupants while keeping total weight at a reasonable level. When we are talking about weight, we need to say that it is rated at only 2,436 lbs, which is quite impressive, even for a vehicle of this size. When the model begins rolling off the assembly line at the plant in Japan in the summer, it will be sold by the starting $24,995 in the North America (the Classica trim with the manual transmission). However, if you would like your Spider to be equipped with an automatic one, be prepared to pay at least $26,345. The Lusso level with a manual and automatic transmission starts at $27,495 and $28,845 respectively. 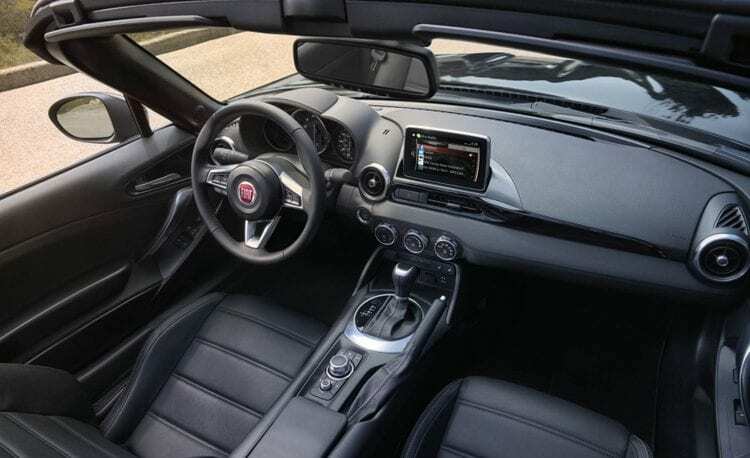 If you want even sportier versions, you can take Abarth models that are priced at $28,195 for the manual version and 29,545 for a car equipped with automatic transmission. Additional features increase these prices at $1,500 – $11,000 range.